LUNCH STUDIO: Noodle Village, with o. We took an old friend to our favorite noodle shop in Chinatown, Noodle Village, and realized that we had never had anything but the duet noodle soup. He tried the lo mein, of which they had an extensive list, and it came out looking a lot like a dry version of the noodle soups. 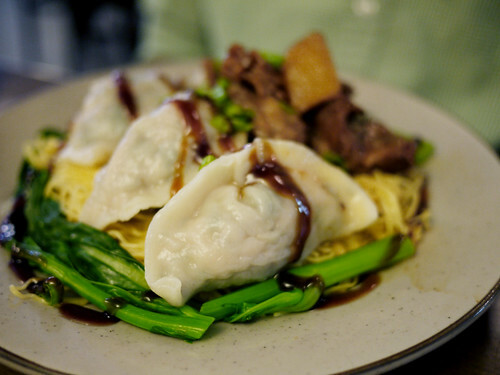 There was a plate of the same egg noodles, covered with wonton and meat, served with a side bowl of hot soup water. Yum.